So Joseph got up and left for Egypt with the baby and the baby's mother. They left during the night. Joseph stayed in Egypt until Herod died. This happened to make clear the full meaning of what the Lord said through the prophet. The Lord said, "I called my son to come out of Egypt." God moves in mysterious ways and uses common people to do his work and accomplish his will. The connection between an Old Testament reference and its ultimate fulfillment in Jesus depends upon Joseph's doing what God asked him to do in the middle of the night. While we know so very little about Joseph, one thing we do know: when God asked him to do the unthinkable, the crazy, and the unheard of, he didn't argue or hesitate; he obeyed. Not once, but repeatedly. I don't know about you, but I hope that I can have the courage and faith to be that bold and obedient! Give me courage and faith, O LORD, to trust and obey as Joseph did. 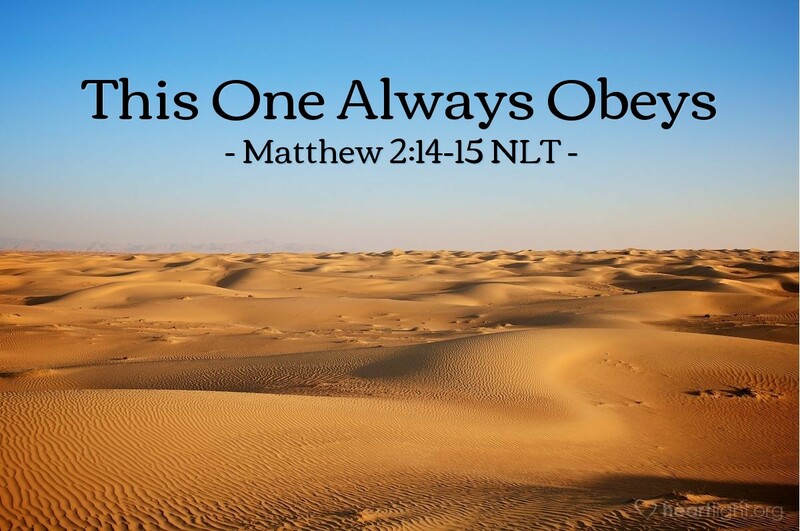 Humble me gently, dear Father, until my pride gives way to one truth: "No matter what God asks, this one always obeys." Father, I make this request in the name of Jesus, who lived and died to be obedient to your will and save me from my sins. Amen.